Rascovar: Prison layoffs another example of ready, fire, aim? Public Safety Secretary Stephen Moyer at podium testifies Wednesday to the Board of Public Works, foreground from left, Comptroller Peter Franchot, Gov. Larry Hogan, Treasurer Nancy Kopp. Photo by Governor's Office. 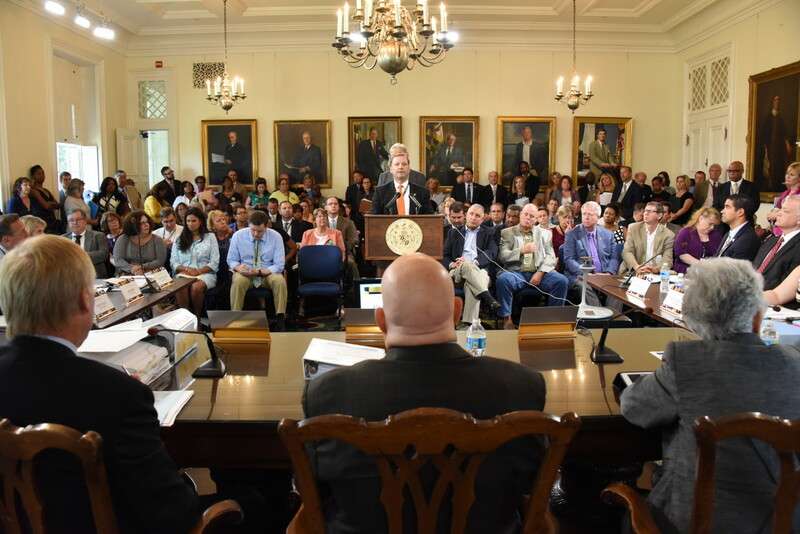 A real-life drama — and personal tragedy — played out last week when the Maryland Board of Public Works took up the Hogan administration’s request to fire 59 state workers who don’t deserve to be coldly thrown out of their jobs. Most of them have earned sterling performance reviews. They have worked diligently for the state responsibly handling personnel matters. It’s a classic case of Larry Hogan’s team rushing to carry out his reform agenda by shouting, “Ready, Fire, Aim” — and hitting unintended casualties. In doing so, innocent victims are seeing their careers destroyed. They are, as many people noted at the BPW hearing, being scapegoated — tarred with the corruption label even though these employees had nothing to do with the decades-old outrages taking place within Maryland’s prison walls. Thank goodness, Hogan is taking the initiative to clean up Maryland’s abysmal prison system. But his administration’s mass firing in the corrections department’s personnel office is badly misdirected. The idea, as explained by Public Safety Secretary Stephen Moyer, is to streamline the department’s hiring and firing process for workers dealing directly with prisoners, especially the prison guards. The current system is shockingly flawed. Wardens — some of them contributing mightily to the problem — by law appoint the correctional officers. Each warden can set his or her own hiring standard. Bad apples have been hired by the dozens. Fingerprinting of new hires has been exceedingly lax. When Moyer tried to fire some 200 guards involved in criminal activities at the Baltimore detention center, he found he couldn’t do so under state laws. What a shameful situation. Moyer and Gov. Larry Hogan Jr. are right to press for a major overhaul to see that the jail keepers aren’t on the take. But what Moyer wants to do first is fire 59 personnel workers who had nothing to do with hiring those bad actors. These workers handle questions correctional workers have about benefits, health insurance, retirement and tons of paperwork dealing with complex employment issues. The entire personnel staff of the state’s parole agency is being wiped out. Yet this office has nothing to do with what takes place within Maryland’s massive prison system. They are far removed from the problem. Moyer wants to centralize personnel matters. The approach sounds good in theory but too often dehumanizes and devalues workers. It makes it maddeningly difficult, if not impossible, to get the simplest problem resolved or question answered. He wants to eliminate all the personnel employees in Western Maryland, except for three in Cumberland and three in Hagerstown. It’s absurd, given there are over 1,200 prison workers in Cumberland and close to 2,000 in Hagerstown. The small number of personnel experts he wants to retain in Western Maryland is off the mark. The situation is even worse in the Baltimore area, where a three-member personnel staff would be overwhelmed by the workload. This plan was designed without considering the human element. At the Board of Public Works meeting, heart-rending tales were told by employees whose jobs are being wiped out. How is a 63-year-old woman with decades of outstanding performance evaluations going to find another job? Moyer & Co. had no realistic answer. This has nothing to do with the much-needed development of a tough, effective hiring and firing protocol. Instead, it is being driven by Hogan’s campaign pledge to cut the “fat” from state government. He’s all about saving money without thinking through the consequences. This time Hogan and Moyer got politely taken to task by Comptroller Peter Franchot and Treasurer Nancy Kopp. The anguish of the intended firing victims who testified was so palpable both officials made it clear they wouldn’t approve the layoff plan as presented. They took special offense to comments the move was part of an effort to root out corruption in the prison system. These 59 individuals aren’t the ones committing illegal acts. They didn’t hire the miscreants. They’re not the ones responsible. They are hard-working state employees who have done their jobs exceptionally well at modest salaries. Kopp urged Moyer to look beyond the budget savings. “People are not just collateral damage, she noted. “They are people,” who need to be treated with dignity and respect, not summarily thrown out of work for no good reason. Moyer went by the book in formulating this mass firing. He conferred with budget and legal officials. But he never sat down and tried to work out a more humane plan with those affected or their union representatives. It’s also a plan that looks good on paper but has serious flaws when tested against reality. That seems to be par for the course in the early stages of the Hogan administration. Ready, fire and then aim. We saw it when the governor killed the rapid rail Red Line for Baltimore before formulating a substitute transportation improvement plan. We saw it when Hogan proudly cut tolls on bridges and tunnels without figuring out how urgent and expensive repair and replacement projects on the Hatem and Nice bridges could be financed on a shrunken budget. We saw it when Hogan grabbed the headlines for shuttering the decrepit Baltimore detention center without first conferring with local law-enforcement and judicial officials on how to avoid disruptions and unanticipated snafus. Moyer now should take his time in putting together a new personnel approach within the department, one that considers the human element. A number of those targeted for firing were denied participation in the governor’s severance program last spring because they were deemed too valuable to the department. Now Moyer wants them out the door without any severance. That’s unfair and makes no sense. Kopp and Franchot should insist that Hogan delay the prison personnel-office downsizing until he submits his next budget, when the people targeted for firing can be offered a buyout package. That’s one approach. Or what about implementing a multi-year plan to eliminate personnel jobs through attrition? What about hammering out a better deal for employees with the union in the months ahead? There’s no need to rush. A humane approach might require approval from the General Assembly for a new severance program and a change in the law so some affected workers can be moved into personnel vacancies in nearby state agencies. Let’s slow the process down so we get it right. The governor’s determination to charge ahead too quickly with his reforms is getting him in trouble. A more deliberate and methodical approach that takes into account the impact on individuals whose lives are affected would pay far larger dividends for Hogan in the long term. The Hogan administration is jumping with both feet into efforts to reduce the prison population and make re-entry of ex-convicts into society easier by getting them jobs. Simultaneously with a release from Gov. Larry Hogan, Lt. Gov. Boyd Rutherford announced the formation of a new task force to review the legal barriers that people with a criminal record face when re-entering the community after time in prison.